Tracking your competitors online just got easier…and smarter. We’ve all had the experience of visiting a competitor’s website, landing page or pricing info and knowing something was different, but not quite sure what exactly changed. Introducing the new and improved Kompyte Time Machine. Now you can see the entire history of your competitors’ website updates in a simple calendar layout. 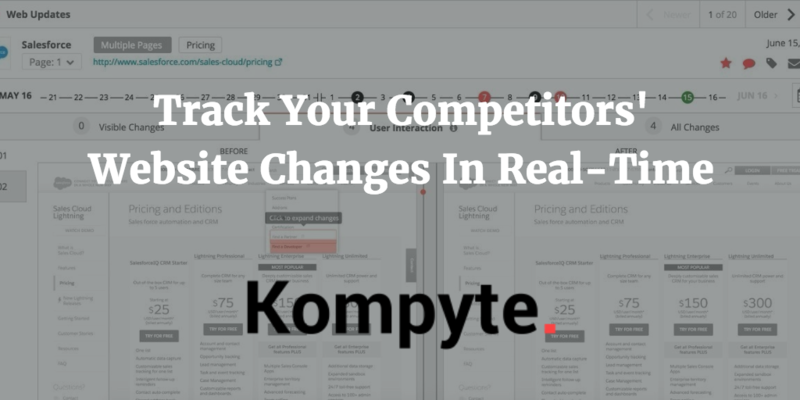 From the moment Kompyte begins tracking your competitors, we begin storing EVERY SINGLE website update they make and storing that data in an easy to use time machine tool that integrates into your competitor tracking dashboard. In the calendar view, black circles mean an update occurred on that day and red circles mean that your team highlighted or commented on the change. Need to know exactly when they changed their pricing? The new timeline view shows you which updates were made and when. Lastly, now you can access the Time Machine directly from your competitor’s profile to see the complete history of changes made to any concrete URL you’ve been tracking. Here you can learn all of the ways Kompyte makes it easy to automate your competitive intelligence. As you know, we’re constantly striving to improve the performance and usability of Kompyte to maximize your learnings from your competitor tracking and minimize your effort by automating the entire process. We LOVE hearing your feedback and use it to steer our product roadmap. Want to see how Kompyte would work tracking your competitors? Enter your 5 competitor names here.